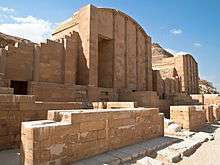 After the turbulent last years of the Second Dynasty which may have included civil war, Egypt came under the rule of Djoser and this marks the beginning of the Third Dynasty. Both the Turin King List and the Abydos King List record five kings, while the Saqqara Tablet only records four. The archaeological evidence shows that Khasekhemwy, the last ruler of the Second Dynasty, was succeeded by Djoser, who at the time was only attested by his presumed Horus name Netjerikhet. Djoser’s successor was Sekhemkhet who had the nebty name Djeserty. The last king of the dynasty is Huni. There are three remaining Horus names of known 3rd dynasty kings: Sanakht, Khaba and perhaps Qahedjet. One of these three went by the nebty name Nebka. Dating the Third Dynasty is similarly challenging. Shaw gives the dates as being approximately from 2686 to 2613 BC. The Turin King List suggests a total of 75 years for the third dynasty. Baines and Malek have placed the third dynasty as spanning the years 2650 – 2575 BC, while Dodson and Hilton date the dynasty to 2584 – 2520 BC. It is not uncommon for these estimates to differ by more than a century. A radiocarbon study done of the period in 2010 gives a reign for Djoser between roughly 2691 to 2625 BC. The pharaohs of the Third Dynasty ruled for approximately seventy-five years. The order of the kings is based on Wilkinson. The number of years as king, the regnal years, is based on Dodson and Hilton. They have the dynasty lasting only 64 years. While Manetho names Necherophes, and the Turin King List names Nebka (a.k.a. Sanakht), as the first pharaoh of the Third Dynasty, many contemporary Egyptologists believe Djoser was the first king of this dynasty, pointing out the order in which some predecessors of Khufu are mentioned in the Papyrus Westcar suggests that Nebka should be placed between Djoser and Huni, and not before Djoser. More importantly, seals naming Djoser were found at the entrance to Khasekhemwy's tomb at Abydos, which demonstrates that it was Djoser, rather than Sanakht, who buried and succeeded this king. The Turin King List scribe wrote Djoser's name in red ink, which indicates the Ancient Egyptians recognition of this king's historical importance in their culture. In any case, Djoser is the best known king of this dynasty, for commissioning his vizier Imhotep to build the earliest surviving pyramids, the Step Pyramid. Some authorities believe that Imhotep lived into the reign of the Pharaoh Huni. Little is known for certain of Sekhemkhet. However, it is believed that Khaba possibly built the Layer Pyramid at Zawyet el'Aryan. Wikimedia Commons has media related to 3rd dynasty of Egypt.